Founders. Executives. Partners. Directors. These powerful women span all sectors of the cannabis industry. 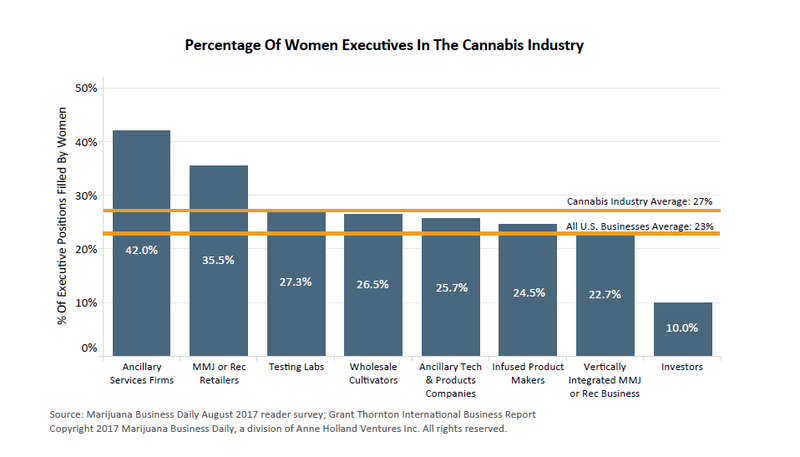 According to our report, Women & Minorities in the Marijuana Industry, in nearly every corner of the cannabis industry, the proportion of executive positions filled by women is higher than the national average for all businesses in the traditional economy. Women are bringing their perspective and expertise to this growing industry. Each speaker at NEXT is selected for his or her ability to push the industry forward, and the innovative women of MJBizConNEXT 2018 are sure to have a lasting impact. Below, and in no particular order, you can get to know just a few of the luminaries sharing her expert perspective and using her voice to impact the future of cannabis. See the full line-up of NEXT speakers here. Nancy founded Wana Brands in 2010, a cannabis edibles and extracts company with products in Colorado, Nevada, Oregon and Arizona. She directs the development of partnerships and licensing agreements domestically and internationally and leads the company’s strategic vision. What’s Next: Insights from Industry Visionaries – a Day 1 Session! Which strategies work, and which don’t, when making the push to expand. How to think about the market you’re in and what angle to take to succeed. Tips on how to roll with the punches in the rapidly expanding cannabis industry. April Pride, Founder & CCO, Van der Pop – A NEW to NEXT Speaker! April founded Van der Pop, a cannabis lifestyle brand for discerning women, in 2016 and oversees the creative direction and evolution of the brand. April previously started two product-driven, design-centric companies in fashion and home furnishings. Her first product company was acquired four years after launch. Strategies for product differentiation, including upping your packaging game and focusing on quality products rather than quantity. How to identify and appeal to your target demographic and understand market demand, then leverage that information to maximum advantage. Erica Dhawan, Founder & CEO, Cotential – A NEW to NEXT Speaker! Erica founded New York-based Cotential, a global consulting firm, in 2012. Through Cotential, she teaches business leaders innovative strategies that increase value for clients, deliver results and ensure competitiveness. Erica also is the co-author of the book, “Get Big Things Done: The Power of Connectional Intelligence,” and hosts the podcast, “Masters of Leadership.” She speaks on global stages such as the World Economic Forum and has keynoted for Fortune 500 companies FedEx and PepsiCo. Executive Summit (Day 2 of 2)*: Taking Your Business to the Next Level: Leadership, Culture & Innovation *For C-Suite executives, by application only. Kim Rivers, CEO, Trulieve – A NEW to NEXT Speaker! As CEO, Kim has worked to ensure that Trulieve, Florida’s first fully licensed, vertically integrated medical cannabis company, provides quality medical marijuana products and top-notch customer service. For over a decade, she has run numerous successful businesses from real estate to finance. Kim also spent several years in private practice as a lawyer, specializing in M&As and securities for multimillion-dollar companies. How building a solid foundation is a crucial component before rapid scaling. How to scale in a densely populated, highly regulated state. How to build the market rather than waiting for the market to build itself, including deepening the patient pool and getting doctors to join in. Amanda oversees community outreach and social responsibility programs for Flow Kana, a California-based branded distribution company that works exclusively with small small farmers in the Emerald Triangle. She is also the secretary of the International Cannabis Farmer’s Association, a non-profit that advocates for research and policies that favor sun grown cannabis cultivation. Previously, Amanda was the manager of marijuana law and policy for the Drug Policy Alliance and the director of research and patient services at Berkeley Patients Group. How California will drive the definition of quality and quantity in the global cannabis market. Which sectors hold the most opportunity and which have the most barriers to entry. Tamar Wise, Partner, Plant Consulting Group – A NEW to NEXT Speaker! As partner at Plant Consulting Group, Tamar works with clients in the cannabis industry in various capacities including product research and development, formulation and procedure development. She has worked in the cannabis sector for more than nine years and helped develop Dixie Botanicals’ hemp-based CBD products. Tamar is an associate partner for the Indian Industrial Hemp Association, a member of the ASTM D37 Cannabis Technical Committee and served as secretary of the Hemp Industries Association’s Cannabinoid Committee. Navigating the banking and financing challenges unique to hemp and cannabidiol. How hemp and CBD consumers are different from marijuana consumers. Trina Fraser, Partner, Brazeau Seller Law – A NEW to NEXT Speaker! Trina brings an expertise in cannabis law to her role of co-managing partner at Brazeau Seller Law in Ontario. She is an adviser for Canadian licensed medical marijuana producers as well as clinics, software companies, investors and entities seeking entry to the soon-to-be legalized recreational cannabis market. Trina also serves on the nonprofit board of directors for the National Institute for Cannabis Health and Education. New opportunities for products and licensing. How Canadian firms are playing a role in other developing cannabis markets. The far-reaching impacts of legalization in Canada on export markets worldwide. Sara recently founded The Batterby Group in Oregon to work with clients in the cannabis industry seeking access to capital for their growing ventures. She also founded HiFi Farms in 2015, a marijuana cultivation company dedicated to craft cannabis and sustainability. Before entering the marijuana industry, Sara co-founded an angel fund in Silicon Valley with the goal of helping investors understand the importance of investing in female entrepreneurs. How to set yourself up for a success by way of proper mindset, preparation and investor engagement. How to drive your own professional fundraising round by sticking to a schedule, structure and commitments. How to close a deal. Rachel K. Gillette, Partner, Greenspoon Marder – A NEW to NEXT Speaker! An attorney at Greenspoon Marder, Rachel focuses on marijuana business licensing and regulatory compliance. She has represented state and locally licensed marijuana and hemp businesses in Colorado since 2010 and regularly represents clients before the Internal Revenue Service’s Examinations, Appeals, and Collections Divisions, including marijuana businesses facing the challenges of IRS adjustments under 280E. Previously, Rachel served as legal counsel and project supervisor for the Merriman River Group, a private national firm specializing in election management, polling, and political consulting. How to train employees on dealing with law enforcement actions, including raids. How marijuana marketplaces are transitioning from black to gray to robust regulation. Effective federal and state legislative advocacy in a post-Cole Memo world. Melanie Nash, Director of Operations, Dark Heart Industries – A NEW to NEXT Speaker! Melanie is the director of operations at Dark Heart Nursery in California, specializing in cultivating high quality clones for cannabis growers. Previously, Melanie was the dispensary manager at NETA in Massachusetts where she helped to build and scale the company to over 500 patients per day within 6 months of opening. Melanie spent much of her career leading teams at retailers including REI, Tumi and Sprint. How to develop Standard Operating Procedures that detail what you want from your employees and stay true to your company’s vision. Steps you need to take as your workforce expands, including how to implement training and on-boarding processes. Ways to develop and maintain your corporate culture as your company grows.